The first structural calculations BIM software for reinforced concrete buildings. To use the software, just draw the structural members to input nodes, loads, constraints… the computational model is fully ascertained from the drawing automatically. With this software, it is possible to design and measure new buildings as well as accomplish checks and structural redevelopments of subsisting reinforced concrete buildings with cladding work, platings, FRP interventions, etc. Particular functions will help in obtaining information concerning the subsisting structure, the material strengths defining its reinforcements. It is also possible to insert new roof structures to the subsisting building, elevations, or even extra floors, etc., and then move on to an overall validation. Finite Element Method solver integrated in the software: A FEM solver is added with the software to provide a unitary experience in structural design. Graphical input, the static and dynamic calculations, structural analysis, modifications and construction documents (charts, tables and reports) are all created with the very same software in a simple and incorporated manner. Graphical analysis of the calculation results: Each object is illustrated with its stress and deformation values once the calculation process is completed. Besides, the detailed calculation leads to numerical form, EdiLus also offers different graphical views that facilitate you to realize how the structure functions at a glance. The process for improvidngh the static or dynamic behaviour of the structure is simple and intuitive. Object oriented modelling, 3D input based on Magnetic Grids: Design with intelligent objects that comprises of information concerning their characteristics of resistance and spatial location. The complicated spatial structures can now be easily modeled with Magnetic Grids, the robust tool that facilitates you to develop a network of magnetic points in space where the different structural components are automatically attached. Automatic reinforcement schedules design: EdiLus can design the reinforcement schedules for all structural members efficiently. A trouble-free and robust editor that facilitates you to freely adjust the reinforcement bars even after the calculation with an immediate re-verification of the structural element. Structural checks and Technical Reports: EdiLus-RC examines structural elements sections as per the EUROCODES technical provisions and regulations. Structural engineers can easily select the national annex and the response spectrum concerning the country in which the calculations should be done. Cost Estimating integrated with structural design: The modelled structure creates a dynamic Bill of Quantities automatically, in reality, the complete project, and any consequent variations, are instantly updated in the project’s cost estimate. 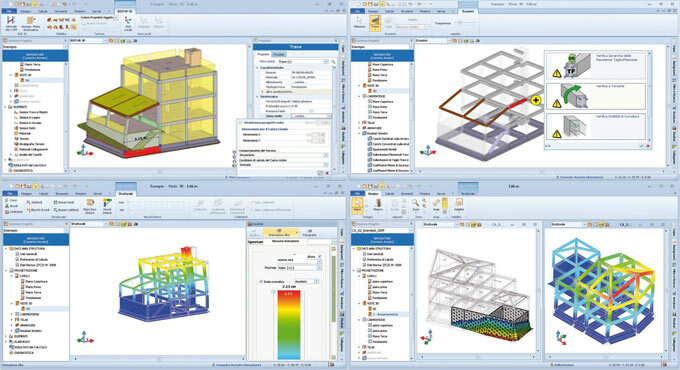 Incorporation with the Edificius BIM model: With integration of EdiLus in Edificius, Architecture and Structural engineering issues can be easily interacted facilitating the structural engineer to design and compute all the structural elements precisely.